As a cancer survivor, I could get all serious and drag out sad stuff. But I won’t. Because Unhinged, a festival to raise funds for … you know, Eku’s head … is not about being sad. It is about friendship, helping, being positive, and taking control by doing something. And feeling really great as a result. I do hope that you, dear faithful reader, will read the wonderful words that explain what Unhinged is all about on the official web site for the event, written by Nephilaine Protagonist. First, there will be awesome music and fun festivities all weekend during the event’s opening. Be there! Second, I am thrilled that -Hanaya- is taking part. To tempt you to part with your Lindens for this wonderful cause, we have created some new fun wearables. 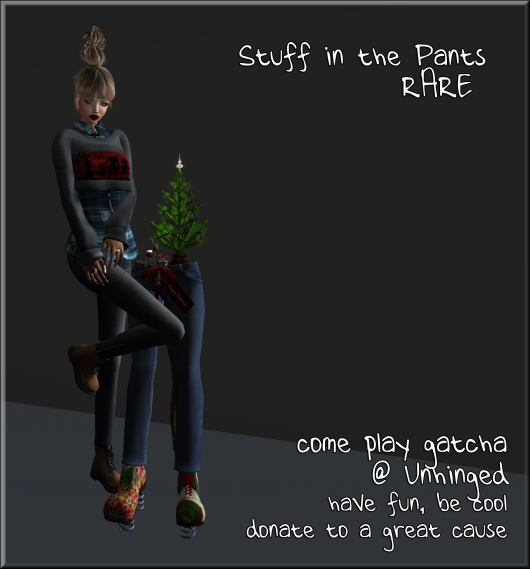 We will have 2 GATCHAs at the festival – Plants in the Pants and Stuff in the Pants. Both types of the wearables attach to the ‘root’ attachment point, so you can have them accompany you as you walk around, dance, sit or whatever you do during your day. If you like, you can also rez them, but careful! Some are a bit primmy. As always, all of our GATCHA items are transfer so you can share with friends. November 15 – December 15, 2012 at a soon to be revealed location. This entry was posted in Events, Product Announcements and tagged -Hanaya-, gatcha, unhinged on November 12, 2012 by moriko.